Did you know that when Santa Claus drops by Chino Valley, Arizona, to pick up children's wish lists, he flies in on a bright red helicopter? Santa's splashy landing is the daily highlight of Chino Valley Hometown Christmas, a two-day event held each winter-holiday season by the Chamber of Commerce and Chino Valley Parks & Recreation. The annual event is public and free to all who want to add extra something to their holidays in Chino Valley. 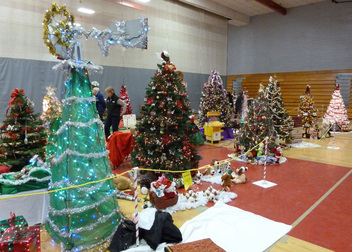 Participating Chino Valley residents, businesses and organizations purchase and decorate a forest of holiday-themed trees that remain on display during the event. Nearly 50 trees get decked out in imaginative themes, often derived from the decorator's interests or Chino Valley's colorful Old West history. Awards are presented, with ribbons made by Chino Valley Quilters. Many trees are created with materials donated after the event, such as plush toys. Sometimes, the entire tree is donated. The event includes live entertainment, food and a craft fair, a great place to purchase last-minute, one-of-a-kind gifts. The greatest thrill comes when Santa is delivered to the jolly site courtesy of Guidance Aviation of Prescott. It's a moment of holiday joy for all children, even the grown-up ones.